The effects of long-term exposure to elevated atmospheric CO2 (ambient + 340 ppmv) on carbon cycling were investigated for two plant communities in a Chesapeake Bay brackish marsh, one dominated by the C3 sedgeSchoenplectus americanus and the other by the C4 grassSpartina patens. Elevated CO2 resulted in a significant increase in porewater concentrations of DIC at 30 cm depth (p < 0.1). The CO2 treatment also yielded increases in DOC (15 to 27%) and dissolved CH4 (12–18%) in the C3 marsh (means for several depths over the period of June 1998 and June 1999), but not at a significant level. Elevated CO2 increased mean ecosystem emissions of CO2 (34–393 g C m−2 yr−1) and CH4 (0.21–0.40 g C m−2 yr−1) in the C3 community, but the effects were only significant on certain dates. For example, CO2 enrichment increased C export to the atmosphere in the C3 community during one of two winter seasons measured (p = 0.09). In the C4 community, gross photosynthesis responded relatively weakly to elevated CO2 (18% increase, p > 0.1), and the concomitant effects on dissolved carbon concentrations, respiration, and CH4 emissions were small or absent. 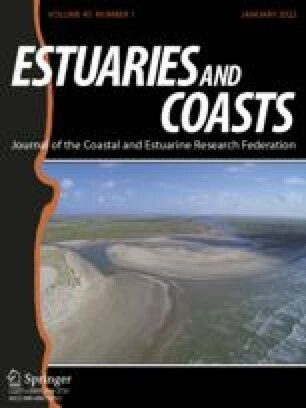 We concluded that elevated CO2 has the potential to increase dissolved inorganic carbon export to estuaries.